I received your Ideal-Lume Standard light. I'm still trying to decide where to finally position the light for best results, but I've noticed a great improvement using your light. Colors appear more vibrant, as well as the range, which adds a more three-dimensionality to images. Excellent! And using the X10 RF on/off switch helps me independently control when I want the light on and off. Just wanted to let you know that the lights work so well. The clever design of the rotating shield works especially well. The lights throw out enough light to see all around the room, no glare at all and less eye strain. Double thumbs up from Al in Panama. I used some double stick tape to mount the lights. The areas on the back of the TV were very limited and I think I hit the mark first time. Again, thanks for a remarkable product, great customer service, wife approval and product packing. I'll be showing off to my friends and trying to get another order together! Well, we've had your Ideal Lume standard lighting unit installed for over a month now behind our Samsung LCD TV, and I must say that it is a big success here. While it may be inherently difficult to get excited about an enhancement whose main benefit seems to be somewhat subtle, as well as dependent on cumulative time in front of the screen, the proof is in the pudding, as they say. Viewing in general just seems "easier" and less strain on the eyes; the shifts in the dynamic range of the light from the screen is less stressful to absorb while at the same time seeming enhanced--like a picture mounted in the perfect frame. Anomalies in the LCD backlighting are far less noticeable, and blank, black screens consequently appear darker, more uniform and less patchy. My wife was initially a bit skeptical ("Why do I want to watch TV with the light on??? "), but I notice even she is starting to come around on this. So kudos to you for providing such an effective and affordable solution to a ubiquitous problem, one made more difficult to address because most people seem unaware that it exists at all. In some ways, the bias lighting issue is the visual counterpart to the lip sync issue on the audio side. People usually cannot identify lip sync problems in entertainment programming when it is below a certain threshold, yet studies prove that even at such lower levels, this miscalibration can have profound negative effects on psycho-neural processing and enjoyment of the presentation. After the Disney WOW disc revealed that my audio, streamed as LPCM from my Oppo to my A/V sound system, was arriving over 162 ms ahead of the video image, I purchased a Felston DD740 Digital Audio Delay unit that also doubles as my new digital audio switch in my system. Again, a tremendous improvement after eliminating a difficult to identify but powerfully negative glitch. "I recently purchased the panelight Ideal-Lume and I just wanted to say WOW huge difference. Such a great product. I installed them on a integrated stand/mount on the back bracket for a 65" 3D plasma display and the difference in unreal. I have used biased lighting before but these are sooo much better. Being able to adjust the amount of light output is key, and since it is such a soft light I can still use it while watching 3D without it taking away from the experience like my old bias lighting tended to do. " "I've been buying your products for the last 4-5 yrs. now. I heard about you from the AVS Forum. I'm very pleased with your merchandise." "Thank you for the fast shipping. I heard about you guys on the AVS forum and have been wanting to purchase this light for about a year now. I am truly glad I finally made the purchase... what a difference it made! I just did a quick test tonight on my 54" Panasonic V10 watching 2 episodes of tv shows, 1 without the light and 1 with (took 5 break in between so my eyes could adjust) and the difference was very noticeable. My eyes did not feel strained/tired at all after using the light (normally my eyes start to fell strained after about 15 minutes). Overall this was probably the best $60 i&apos;ve spent on my home theater setup, thanks again!" "I&apos;ve been a fan of your products for a long time. I&apos;m a colorist mainly working on shows for all the discovery channel networks, national geographic, pbs and others. Prior to starting my own business I was introduced to your products at a previous place that I worked. In my business accuracy is paramount and the Ideal Lume Pro seemed like a no brainer for a new suite I&apos;m building as a monitor surround. I&apos;ll be sure to mention your great products to other colleagues. I&apos;m also an author having written 6 books on postproduction and I also regularly do online training with companies like Lynda.com and CreativeCow, so in my next titles I&apos;ll be sure to mention how awesome the Ideal Lume Products are. "Hey guys...I received my I-L Standard today...calibrated my Panny V10 with DVE HD Basics on BD, then installed the light... WOW ! What a huge difference the light made. I actually like my TV now...even though I&apos;m replacing it Monday with a new Sony XBR8 ! I&apos;m just not a plasma guy and my viewing conditions are better suited for an LCD... I can only imagine how much more happy I&apos;m going to be once I get the new XBR8 claibrated....all thanks to your awesome product ! I&apos;m slowly becoming a very picky videophile and I wish I would have ordered this light years ago....there is no substitute for having CORRECT back lighting (just like your website explains), and no more eye strain ! You should offer a double your money back guarantee...I can&apos;t imagine anyone sending one back because they didn&apos;t like it! Also, thanks for shipping the product with an extra bulb ! Very happy new customer !" "I&apos;ve actually ordered from you folks before (10/29/08). This most recent order is for my brother-in-law (kind of a home theater &apos;warming&apos; present for him!). The first time I ordered, though, I found your site after seeing some discussion on TweakTV.com about backlighting. It&apos;s really a great product and has made a tremendous difference in my TV watching!" "This is my 5th ideal lume i&apos;ve purchased. cant watch tv without one!" "Thank you for the update on shipping. I am a Technical Director at [Leading movie FX house] and heard about your product through some co-workers. I also frequent avsforums.com where your lights are highly regarded. I will be mounting this on my new Pioneer PDP-5020FD which arrives on this Thursday. I&apos;m really looking forward to mounting the light and seeing what all the praise has been about! Thank you!" "I have received the replacement fixtures and bulb. Everything works great. I would like to let you know that I am extremely impressed with CinemaQuest customer service. Since I was already quite a big fan of your products, combining that with the way you take care of your clientele makes for a rock solid experience. Two of my friends recently bought HDTV sets, and I will definitely insist that they purchase your products (a quick demonstration should take care of that easily). I will be returning to do more business with you in the future! Have a good one." "I am quite amazed at the difference in the viewing experience after adding two Ideal-Lume lamps. I believe I am seeing more detail in my 1080p picture, without my eyes straining to keep up! It is a most pleasurable, visual, phenomenon. Much thanks." "I spent some quality time viewing last night - Wow! What a difference. You can feel the difference in eye fatigue, there just isn&apos;t any. I have always been very sensititive to TV viewing in the dark, this was an entirely diffrent and much more enjoyable experience. "I delayed ordering the Ideal-Lume for over a year because I just didn&apos;t believe it would make a big difference. Was I wrong! My wife has watched me spend an obscene amount of money [on] electronics the last 20 years and only one thing had impressed her, TIVO. That&apos;s until I put Ideal-Lumes on our TVs. She has raved about how much easier it is to watch TV. And I share her feelings and wish I had ordered when I first read about the Ideal-Lume. I&apos;ve put them on our 55" rear projection TV and found that three worked great (two on each side and one at the top). And one for our 32" flat panel in the family room. Now she has asked me to order one for the 42" flat panel in the bedroom. Great product, everyone should have an Ideal-Lume on their TV." "This is our third order order from you. The lights are popular within our family. This one goes to my 80 year old mother-in-law. She saw her son&apos;s which we gave to him last year and went nuts." "You run a class act over there, I must say. Thank you." "I have one of these already [Ideal-Lume Standard], and it is fantastic! I now need one for our other HDTV viewing room. Thanks for offering such a great product!" "I&apos;ve owned two previous lights of your company.... excellent product!" "I heard about you guys from an article in the local paper. Cinemaquest was mentioned relating to backlighting, I went to Google, and the rest is history. This thing works! According to what I read on the website, the brightness level could be turned down to get a better picture in the process. Mine went from about 65 down to about 35 and the picture looks better than it did before. Good Stuff!" "Thank you. The replacement cord works great and I really enjoy my enhanced lighting on my entertainment systems. You have great products and great customer service it is a pleasure to do business with you. 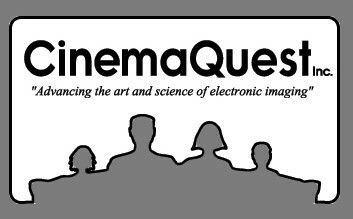 I will recommend Cinemaquest to my friends and family." "I received my bias light (the Ideal Lume) on Friday and have been playing around with it over the weekend. I used the "Ambient Light" test on the DVE disc to calibrate how much light I should allow the lamp to shed. I mounted the light on the wall directly behind my 34" Sony XBR970 and watched a variety of programming, most notably, the season 3 finale of Deadwood last night (why did they cancel this amazing show!!?!) - The resulting picture quality when using the light is amazing. Everything you&apos;ve read on this thread is true. The colors are more vibrant. The blacks are fantastic and the eye strain is gone. I watched serveral scenes last night with the Ideal Lume on, then I&apos;d watch the same scenes with the Ideal Lume off. I did this for about 1 hour and the differemce between the PQ with the light on and off is substantial. This lamp was a wise purchase. The shipping was fast, the packaging was awesome and the communication was top notch. "I received my bias light today and installed it. It is the perfect compliment to my system. Black levels look great, and I believe I am seeing slightly less rainbow effect on my DLP. I couldn&apos;t be happier with my purchase. In the coming year, I will be helping at least 2 people with home theater purchases. I will make sure to let them know that stopping by your site is an absolute must." "Thank you! The customer testimonials on your website are understated. I haven&apos;t yet received my Ideal-Lume yet, and I&apos;ve already received more ( and better ) customer service than I did trying to purchase a $1200 A/V receiver from TWO dealers! Perhaps you might consider a company name change to " CustomerService Quest " :^) You would get THOUSANDS of cold call names, because the consumers in this, and all other markets, are STARVING for great customer service!" "In response to the question you asked, I heard about your company when I was visiting my brother, who works at Image Entertainment in L.A. I was looking at the lighting in one of their edit bays, and was so impressed by it that I went around back to see where it was coming from -- it was there that I found the Ideal-Lume. I wrote down your company name, and when I got home, I did some online searching until I found you. When I saw how reasonably priced it was, I decided to buy one. What a great product! I wish I&apos;d known about it sooner. Thanks for the quick shipping! "We are using the Ideal-Lume in each of our edit, compression and QC rooms with great results. The feedback I&apos;m getting is that eye strain has been greatly reduced. The rooms also look great since they&apos;ve been installed. We recently moved to a new facility and were able to design the production department from the ground up. I wanted backlighting with the proper color temperature for each room and was given your website from a friend of mine over at Fox Studios. Your website and the documentation that shipped with the units were very informative and well written. The fact that your product was endorsed by Joe Kane and Perfect Vision also made my initial purchase decision much easier. I ordered two more today because I ended up initially forgetting one room and we are also in the process of installing an additional edit bay. Thank you for the inquiry and a well built product. "I heard about the Ideal Lume from an article in a home theater magazine (I don&apos;t remember which one) and also on the Secrets of Home Theater website. Thanks, great product, I had one with my previous home theater!" "I have heard about your products from the AVS forum initially and while The Perfect Vision does mention the ideal-lume from time to time, I don't feel that your product gets enough exposure. I can't ever recall seeing a bias lighting setup at any home theater store nor has anyone educated me about the benefits of bias lighting when I shop for displays. More people should about the benefits of bias lighting and how it can enhance their viewing experience." "Thanks a lot. I hope more companies were as decent and responsive as you. The world would be very different...."
"After thinking about buying an Ideal-Lume backlight for months now I finally decided to take the plunge (a whole $60) and purchase this light. Before using it, I was watching movies using a dimmed lamp off to the side of the viewing area. While I had read many people raving about the use of this backlight, since Im not a major videophile I was uncertain whether I would notice much of a difference. I attached it to the back of my TV using stick on velcro fastener and have it shining on the wall behind my TV. My TV is positioned across a corner of the room so the lighting is a bit uneven behind the TV and off to its sides but not too bad (Im working on trying to fix this problem - maybe by using electrical tape on the bulb to block part of the light output). Anyway to the punch line - the difference is SIGNIFICANT. Watching DVDs with this backlight is a much better, more theater-like experience. I was pretty surprised at how much of a difference it made and I would strongly recommend this small investment as a MAJOR enhancement to the quality of your home theater experience. Just wanted to throw this out there for anyone else who is deliberating on lighting or who isnt even aware yet of the options. Its a small investment for a major payoff! "Thanks very much for the light. It&apos;s even nicer than I imagined it would be. With the filter kit, I was able to tweak the light for just the right amount of "glow" behind my 42" Toshiba rear projection set. Quite an improvement over the lamp I had purchased from a local hardware store. I heard about you on the AVS forum. There was a discussion about bias lighting with a link to your website. The lamp kit arrived promptly, and I appreciated the double boxing." While the theater is still a work in progress, the bias light is working like gangbusters in the living room. Add me to the list of other impressed customers! it makes an amazing difference. I tried it with just one ND gel and it was to bright. Added a 2nd gel, and it&apos;s probably just a shade to dim. I&apos;ll have to just use a piece of the 2nd filter to make it just right. My theater is being built by myself and a close buddy, who is a professional projectionist and Video Engineer. While he may not be a CEDIA member, I&apos;ve been through enough with him to trust him implicitly, besides having seen his work and know his work ethic. My theater is nothing like the poor examples shown in so many magazines. It is a theater when the drapes are closed, and nothing else! should have it done by the middle of this month, if all of my schedules work out. Thanks again for all of your input, and also for making such a great product! " "Hello, just a quick note to let you know we are really enjoying your product at home. The picture on our two year old TV has never looked better. Thanks for making such a thoughtful product. I&apos;ll certainly be recommending you to my friends/videophiles as they notice &apos;something&apos;s different&apos; I found your product info in one of the A/V magazines some time ago. Thanks again... "
"Thank you for the fast service and the courtesy of combining the orders. It dawned on me to order the dimming kit after I had closed out of the first order so I really appreciate this and will make sure my video friends know about your company, your products, and your thoughtfulness." "I read about the Ideal-Lume in The Perfect Vision. I received the light early this week and it looks awesome. It creates a perfect viewing environment. I am using with a Mitz Diamond Series 65" RPTV." "How is the right light, designed specifically for wall mounted plasmas overkill? You&apos;ll have it for twenty years. You spent how many thousands on a good plasma, did all that research, but won&apos;t pony up $150 for the Ideal Lume? Perhaps you just need a testimonial to goose you, so here it is. The Ideal Lume [Plasma] light is the single best video accessory I&apos;ve ever encountered. For $150, it will make far more difference to your viewing pleasure than, say, a megabucks video processor outputting at the native rate of your plasma. I&apos;m not kidding. They&apos;re both certainly worthwhile, but geez, the I-L costs just $150. I originally purchased one for a Sony 34HD1 direct view set, and it worked wonders. But it was when I switched to plasma that the Ideal Lume light really earned its keep. I can&apos;t watch plasma now without it on. Black level, color accuracy, three dimensionality, all seem improved dramatically by the I-L. It&apos;s like a completely different display. I defy anyone to see a calibrated plasma with an I-L behind it and complain about black level in any respect -- even on washed out Pioneers! You can watch longer with less fatigue, too (not necessarily a good thing). It&apos;s great to get such personalized service, with the email addressing me by name, and not only a tracking number, but a toll-free number to call. As a consultant who advises on communication, follow-through, and training, it&apos;s good to see the quality of a company&apos;s products also reflected in their service. I first heard of your company a couple of years ago, reading an article on bias lighting in Home Theater Magazine. To my knowledge, you&apos;re still the only company offering color-balanced bias lighting directly to consumers. The Ideal-Lume has enhanced our enjoyment of movies immensely, and I can&apos;t imagine a serious viewing session without it. “Thank you so much for your quick response. I am very pleased to see that you and your company take these things seriously, and quickly respond to them. I am in customer service, and I appreciate you treating me the way I like to treat my customers. I will watch for the replacement diffuser that you are sending me. On a separate note, I would like to say that my brother and I are very pleased with how your product has enhanced our TV viewing experience. When my brother received his light from you, we tested it on my 57" RPTV. The benefits were not immediately noticed by us. What I did notice at first was that the picture looked too bright. I had just recalibrated my set the day before using an Avia disc, so I thought that perhaps I didn&apos;t adjust it correctly. We kept watching the movie (Attack of the Clones), and about midways through I couldn&apos;t stand the brightness anymore. I adjusted my set one click down on both contrast and brightness. Wow! What a difference. The colors became more brilliant and more accurate, blacks were blacker, and the overall picture detail was improved. We both watched the rest of the movie pretty much in awe. At the end of the movie I suggested we try looking at segments of the film with the Ideal-Lume off. Within seconds we noticed the opposite of what we noticed with the light on. Colors were muddy and less defined, blacks were more gray, detail was lost, and there was a huge increase in eye-strain. The overall picture became muted, and somewhat dull. “I recently got one of these light fixtures, a bulb and the f-stop dimmer kit, and couldn’t be happier. The guy who runs the place… is with ISF and from talking to him on the phone, he seems to really know his stuff. From an experimental perspective, my viewing enjoyment has increased markedly since I got the light, mostly because I no longer get eyestrain from watching in a dark room. Before I got this bias light, I was watching TV with an overhead incandescent which was creating all kinds of problems for me with reflections of the protective screen. “My light arrived today. I have ordered many things over the last few years via the net, from tropical fish to hobby supplies. I have NEVER seen such absolutely bulletproof packaging as the way this light arrived. I think Godzilla could have delivered the package without risk of damage. Excellent job. And the light, I should have bought one a long time ago and got rid of the 6500K-aquarium bulb I was using. I doubt if it was my imagination that the picture on my Pioneer Elite 610 immediately looked better. This was actually my second order from you. I had purchased “Video Essentials” some time ago. I think I originally found your site through The Home Theater Spot. I would recommend you to anyone looking for these types of products without any hesitation. Both service and products are exceptional! “I first learned about the benefits of backlighting with Joe Kane’s laserdisc setup guide about 10 years ago. I researched this product on your website and found out that it was exactly what I had been waiting for. I had too many questions to order it directly online so I called your office and spoke to Belinda who answered all my questions…Just wanted to let you know that I love the Ideal-Lume light. I use it when I do some serious watching and I must say every DVD/laserdisc looks better than when I first saw it with the other type of side lighting I had. It just looks so much better with the Ideal-Lume light. “Just wanted to pass along a positive customer service story. I received a CinemaQuest (Ideal-Lume) back lighting product for a present last Christmas. The product worked great and I was very happy with the effect it had on my viewing experience (ISF’d TW40X81)…To be honest this is the way I would expect a good company to handle this situation. It just seems rare to actually find a good company these days. CinemaQuest obviously stands behind their product. If you need some good back lighting for your home theatre I would recommend that you check them out. P.S. And no, I don’t work for them. Wow…thanks for the quick response. I wish all companies resolved such matters as quickly. You folks are great! “I’m going to add the Ideal-Lume to the products list on my site. Can you provide pictures of the models so I can post images? Thanks. “Len and I want to thank you for your wonderful IDEAL-LUME Video Bias Lights for the back-lighting of our two television sets and our home theater. Not only does this light improve the color and picture, and it reduces eyestrain and provides a delightful lighting for the room. It is the only light we need while watching television or home theatre. We are very much looking forward to the availability and your distribution of the same type of light, which will be conducive to computer use! Please consider this letter an order for one when it becomes available.